Aasif Karim – Chairman Safinaz Foundation & Kenya International Sports Film Festival. 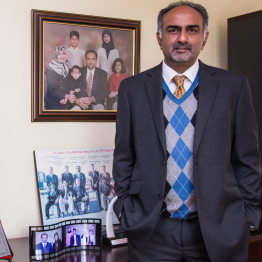 Aasif is a Kenyan entrepreneur and philanthropist who has been engaged in business for the past 30 years. His interests span across Insurance, Real Estate and Media. A former Kenyan International Sportsman in Tennis and Cricket, Aasif has had the humble privilege and honour of representing Kenya in various global tournaments. Mr. Karim is the Founder and Chairman of Safinaz Foundation, dedicated to promoting sports in Kenya. The Kenya International Sports Film Festival (KISFF) is one such initiative. Mr. Karim through Alpha Sports Ltd, has for 18 years published and distributed The Sports Monthly Magazine with a view to inspire, educate and encourage Kenyans to embrace sports. Aasif is also a proud member of The Karim sports dynasty that has made remarkable contributions to Kenyan Sports with each generation of the family having shouldered the responsibility of keeping this legacy alive. The Coffee Table Book and Documentary – The Karims -A Sporting Dynasty. Three Generations, Two Sports, One Family is the pride of Kenyan sporting history. Safinaz Foundation firmly believes that while Sports unifies society, Film inspires society. Aasif, is a practicing Arbitrator, having recently qualified as an Arbitrator (Fellow) and Accredited Mediator of the Chartered Institute of Arbitrators (UK). Kenya International Film Festival [KISFF].